For Immediate Release: Posted On 8/5/2015 By Industrial Magnetics, Inc.
Industrial Magnetics, Inc.(IMI) recently introduced a new T-Trap magnetic separator for liquid processors that offers improved metal capture rates, durability and ease of cleaning. The new design features a single, large-tube magnet which provides direct, in-the-flow contact of the product to the magnetic tube. This increased contact area offers an advantage over traditional plate style T-traps, which rely on a diverter in attempt to angle the product flow towards the magnet. The single, large tube design also has an advantage over multi-tube styles, in that the chance for catastrophic failure is greatly reduced. As a result of line pressure and attracting magnetic forces, multi-tube styles can experience weld failure over time, releasing metal and magnet material into the liquid line. 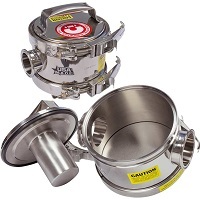 The Large-tube T-Trap is ideal for liquids, purees and products that may contain small solids in high flow rate processing lines, such as juices, applesauce or cottage cheese. They are typically placed in front of pumps, screens and mills to ensure product purity and to protect vital plant equipment from costly metal damage and system downtime. Available in 1-1/2" - 6" line sizes, the T-Trap can be installed in either horizontal, vertical or sloped line orientations. For additional information, view the T-Trap magnetic separator product page on the company’s website, or contact imi@magnetics.com.